The following article, transcribed from the Northwich Guardian, describes a memorial service that was given by the Vicar of Weaverham, the Reverend Francis Young. This must have been given at some time after the start of the Battle of the Somme on July 1st 1916, on which day 19,240 men died – including Private Arnold Robinson from Weaverham – who is mentioned in the article. 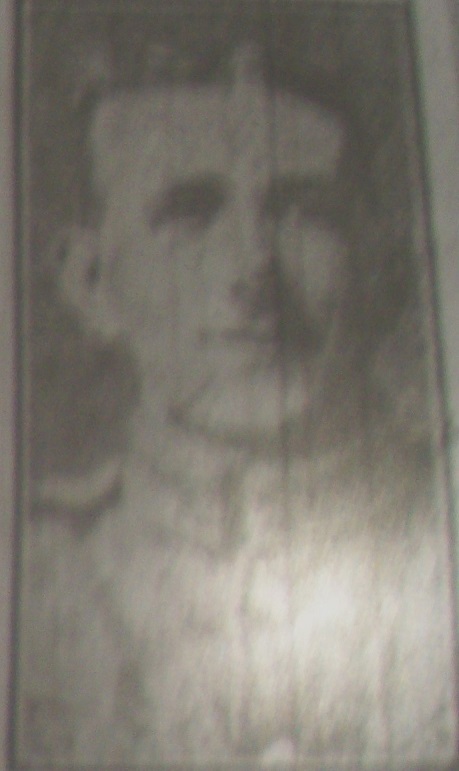 Captain de Knoop, mentioned in the speech, had died on the 7th Aug 1916. Just over one month later, on the 9th of September, not long after this service was held, the vicar’s own son, Stuart, was killed. A memorial service attended by a large congregation, was held on Sunday evening at the Parish Church. The flag on the tower was flown at half-mast, the bell rang a muffled peal and the national flag and massive wreaths were suspended from the pillars of the choir. The service began with the opening sentence of the Burial Service, which were chanted as the choir passed up the nave of the church, and the 60th / 90th (??) Psalm was sung. In the special prayers the names of the officers and men who had recently fallen were commemorated, John Julius Jersey de Knoop, George Dewhurst, Arnold Robinson, Samuel Voinus, Thomas Cross, Percy Wilkinson, William Ashley, William Whalley, John Rutter and Robert Clarke. The relatives in most cases attended he service. Amongst the select hymms were “ Now the labourer’s task is o’er” and “ Through the night of doubt and sorrow.” The Dead March was played by the organist ( Mr A. Boyd ), and the Last Post sounded by Mr E.G. Wood.. The same determiniation upheld the others who had made great sacrifice in their behalf and that of England. The mourners should derive consolation from the thought that those who believe in Jesus Christ never really die. For them, death so-called was the entrance into a larger, fuller life in which God found some grand employment for His sons. John Julius Jersey de Knoop is interesting in that he was from a family with German ancestry. 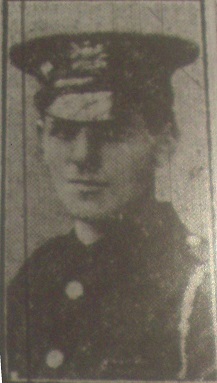 He was born in Rusholme, Manchester and died in Hod El Bahein, Kautora, Egypt on the 7th August 1916. 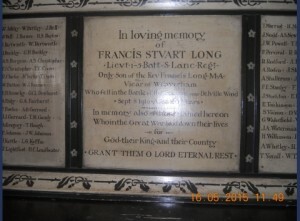 The plaque erected in St Mary’s Church in Weaverham commemorates 69 parishioners who died in the First World War, including the Vicars Son, Lieutenant Stuart Long and Private Arnold Robinson. Not surprisingly prominence is given to Lieutenant Long, his memorial occupies the entire central portion of the triptych that forms the lower section of the memorial. See http://www.carlscam.com/warmem/weaverhamwm.htm for better pictures. The memorial outside the church lists 68 men who died in the First World War and also 23 men who died in the Second World War. 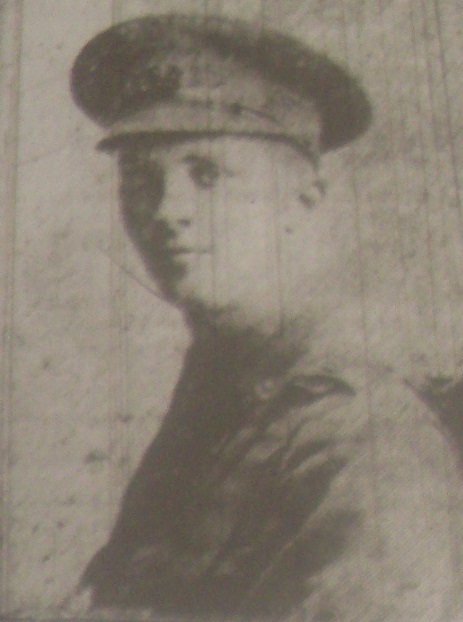 Private Arthur Shaw Burgess of Hartford died of influenza on 2nd November 1918 aged 22, so close to the end of the war – he is buried in St Mary’s churchyard. Click here for newspaper transcript. However at that time the Parish of Weaverham was much larger, including a lot of what is now in Hartford or Cuddington and Sandiway. The memorial at Brunner Mond, Winnington, list 176 men who died in the First World war. The memorial from Bryn chapel lists 5 men, two of whom are also listed on the Weaverham memorial. We have have found a few obituaries of those mentioned on the Weaverham War memorial in microfiches of old copies of the Northwich Guardian. Extracts from official regimental “War Diaries” will be included where possible – however these rarely mention casualties by name. The Battle of Delville Wood took place between 15th July and 3rd September 1916 , and has particular significance for Weaverham because Lieutenant Stuart Long, the son of the vicar of Weaverham, died there on the 9th of September. 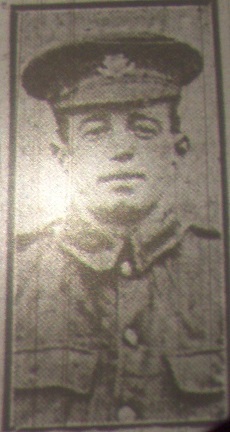 Private Arnold Robinson was killed in action on the 1st July 1916 aged 26 – He died on the first day of the Battle of the Somme. He joined the Manchester “Pals” with other workmates from Brunner Mond. Private Robert Clarke was another worker at Brunner Mond who signed up at the start of the war. 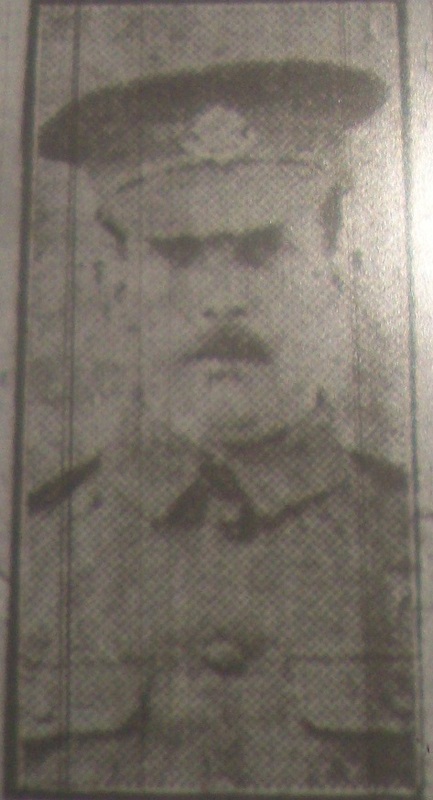 However he joined the 10th Cheshire Regiment, not one of the “Pals Brigades”. He died on the Somme on the 26th August 1916. His obituary describes him as “Sandiway soldier John Birtwistle”. If you are a relative of any of the men mentioned here and you wish to amend, correct or add to the information on these pages then please do not hesitate to contact Weaverham History Society. Carls Cam has good photographs of many Cheshire memorials , with transcriptions of the inscriptions. The Commonwealth War Graves Commission website has details of all the fallen from the first world war. This is often a good starting point because it will give you the service number and regiment. You can usually find the medal record for a soldier, and this will tell you who the medals were sent too. If you know the regiment they served in you can look up the regimental “War diary”. Lieutenant Long went to Manchester Grammar School. The school magazine for the period covering WW1 has been digitised. It contains reports from the front and obituaries. Obituaries from the Northwich Guardian were transcribed from microfiche copies held at Northwich Library. I would like to thank and acknowledge all these sources.